I've given you several recipes for Knäck, but when I found this amazing idea at fellow blogger Anna Billing's site I knew I had to try it. I had an unopened bottle of Marasca Cherry Syrup on my counter, and using it to cook caramels was just brilliant. I opted for toasted almonds rather than raw this time, it really pairs well with the sweetness. Stir together syrup, sugar, cream and butter in a thick-bottomed saucepan, and cook on medium heat until it reaches 125-126°C. 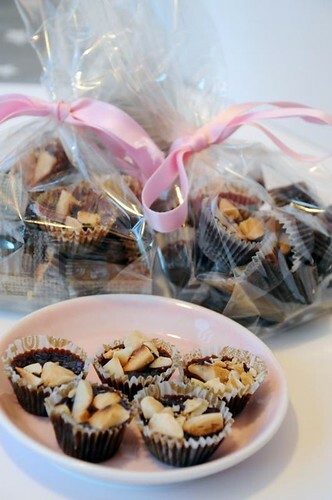 Pour immediate into tiny paper cups (there are special ones for Knäck) and sprinkle with the almonds. Let them set completely, I usually put them in the fridge. A tip for pouring easily: transfer the hot caramel to a small pitcher with a spout. It makes it a lot easier. Sounds delicious with the cherry syrup!